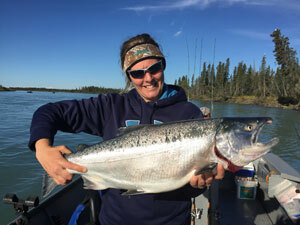 Fish the world famous Kenai River with our Kenai River Fishing Guides for a chance to catch king salmon, silver salmon, sockeye salmon, and rainbow trout. Our Kenai fishing guides have the experience and expertise to help you catch fish and make a memory of a life time. We offer both half day and full day Kenai River fishing trips to fit your budget and schedule. You can book multiple days and fish for several species of salmon and trophy trout. Now you can experience the best of both worlds by booking a saltwater halibut fishing charter with us out of Homer or Anchor Point, and then combine it with a day of salmon or trout fishing on freshwater on the Kenai River. Target Species: King, Sockeye, Silver Salmon or Rainbow Trout on the Kenai River. 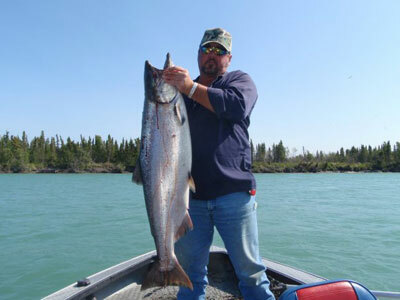 Description: Half day of Kenai River fishing for salmon or trout. This trip is great for beginners or seasoned experts. Duration: 8 to 9 hours of fishing. Target Species: King, Sockeye, Silver Salmon,Trout or a combination of multiple species on the upper and lower Kenai River. Description: Full day of Kenai River fishing for Salmon and or Trout. This trip is great for beginners or seasoned experts. Fish with the experienced Kenai River Fishing Guides you can trust! Our guides have decades of experience fishing the Kenai which means you have a greater chance of catching fish and making a memory of a lifetime. Kenai River Silver Salmon start coming in August first but Peak fishing occurs August 15 to August 31. 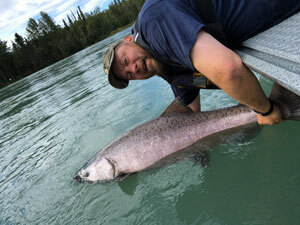 Second run Kenai River Silver Salmon start up September 1 and Peak between September 15 and 25. 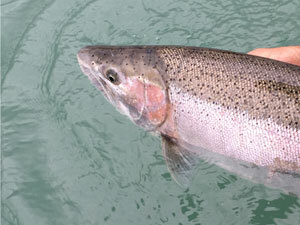 Kenai River Rainbow Trout start getting good mid August and peaks Mid September to Mid October. The “Big Trophy Trout” is best Spetember 15 thru the month Octuber. We specialized in Both terminal and fly fishing for trout on the Kenai River.